Most comfortable bed I ever had. Did not look forward to getting out of bed to go to work. 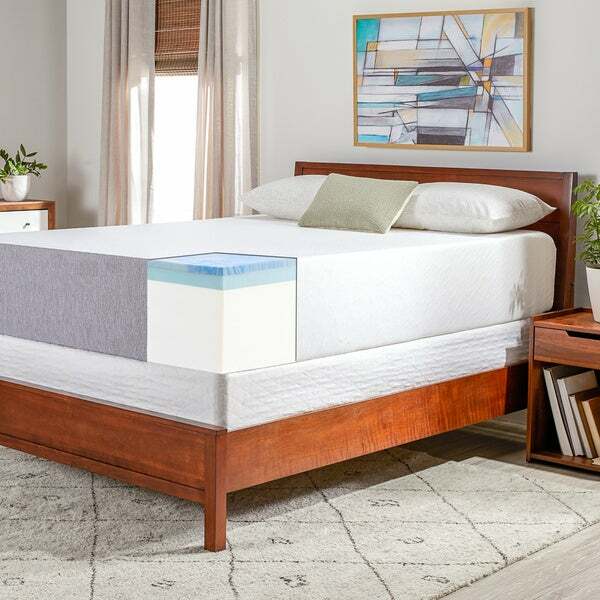 Sleep in unparalleled comfort with this OSleep gel memory foam mattress and foundation. This medium firm mattress combines two layers of gel memory foam and a supportive foam base. The foundation will serve to protect your mattress and keep it in good repair to ensure the utmost in restorative sleep. Perfect for partners, this mattress eliminated motion transfer so you don't wake up your partner if you need to get out of bed. I did very thorough research for months before I made my purchase. I read all the reviews and no one really had anything bad to say. This is the most comfortable mattress I've ever owned. I thought it might be too high for my bed, but it's perfect. The foundation was very easy to assemble. It took about ten minutes. Some people spoke of the mattress having an odor and some did not. My mattress did have a factory like odor for about a week or two, but nothing unbearable. I have two friends in the market for a mattress and I highly recommended this one. This is my first gel/foam mattress and frankly it's the best night's sleep I've ever had. The gel layer keeps things cool and the medium firmness is just perfect. The foundation was super easy to assemble and the foam mattress was no where near stinky. I am now a convert and will stick with a foam mattress from here on out. Great value, easy to transport and comfortable! I have a small one bedroom duplex in NYC that I recently renovated. For years I've dreamed of a queen size bed but couldn't consider one due to the very narrow stairway in my Brownstone building. So after reading all the other reviews on Overstock about this product, and avoiding the (much) more expensive brand names I bought a medium/firm mattress. I'm VERY pleased I did. The product arrived in two boxes and each piece could be carried by one man down/up my narrow building stairs. The supporting frame is solid wood, cleverly designed, easy to assemble and has a nice quilted cover. The Gel/Foam mattress unrolled over top (it's good to have help getting it square) and expanded from <6" to 14" within 12 hours. Some mentioned a slight odor and I noticed it at first. So I left it unmade for 24 hours with a fan in the room and have not smelled it since. I put a queen-sized mattress pad (one recommended for foam mattresses) on it and new 1500 thread count sheets ... also from Overstock. It's heaven. As others have mentioned the only problem with this bed is that one doesn't want to get out of it. I can highly recommend this product for it's price, ease of installation and comfort. Love this mattress. Added the two inch foam gel pad to raise because I didn’t use the frame that came with it because I was putting the mattress into my own bed frame, which I also purchased from Overstock. UPDATE: I’ve been meaning to write this for over a year. Thank you to all who responded with your tips BUT most of all, THANK YOU to the seller/manufacturer who responded when I contacted them when mattress didn’t inflate after weeks. I sent them the photos they asked for and within about two weeks I had a complete replacement at my front door! This time the experience was PERFECT. Nothing wrong with foundation. Bed inflated within hours—fully inflated by next day. What a difference! Best of all—it’s comfortable, firm for backs and never gets too hot from body heat. Over a year later, it’s like new. Thank you to everyone involved for such excellent customer service. Ive referred folks to this bed, but I apologize for taking so long to update this. This is a 5-star experience. Leaving this old 2017 review in case someone needs it but basically contact customer service for any issues: Foundation went together easily, however center support board was cracked. I taped it and it seems to be fine since mattress support boards go across it and are primarily supported by the outside frame. A zippered cover would have been better. This came with a drawstring around bottom that leaves bottom uncovered. Drawstring was difficult to get snug. I'm using a platform bed so it's okay but would not advise leaving bottom open if setting directly on floor. Love that this is a 14" memory foam with gel cool layer but would love it more if the mattress would fully inflate! It's been two weeks and the middle is 13" high with one end at 9" and the other at 11". I've had a floor heater on to keep the room warm and vacuumed twice per online tips but still waiting. Mattress cover is beautiful and high quality just hoping the mattress will inflate. If anyone has inflation experience with this mattress, please share. Ok, so this was a hard decision to make as I've never bought this sort of mattress before. This truely is a luxury mattress at 14 inches! The gel memory foam is such an innovation over the traditional spring mattress. I am giving it 5 stars because it has exceeded our expectations. Note: The set is just the mattress and box springless foundation and NOT with the bed frame furniture. The mattress came delivered to my door and we quickly unboxed everything. It was setup in minutes. The mattress was exactly what it advertised. It came suction packed in a long box. I had to build the box spring myself from the boards provided. The mattress inflated to every inch of the 14 inches advertised. It is actually quite heavy. I've had it six months and I still delight in being able to put items on the bed next to me without them tipping over. I recently purchased this item as a wedding gift for my daughter. However, after setting it up and trying it out myself, my sleep quality increased dramatically. This was a surprise as I had already purchased a new foam mattress from Casper a few months earlier, and was more than satisfied my new Casper. Due to health issues at my advanced age, however, I have a difficult time staying asleep on any mattress. I was shocked at the fact that my new Luxury Gel Memory Foam Mattress provides even better sleep for me than my Casper. I believe the reason to be is just a touch of extra firmness that provides me that extra ability to stay asleep. Not saying that everyone will have this same experience, but in my case my health issues are overcome better on this mattress than any other I have found. The mattress is very firm, but not too hard. As a result, I am keeping the Luxury Gel Memory Foam Mattress for myself while my daughter is delighted to be getting a nearly brand new Casper mattress for herself. A true win-win situation - I purchased the Luxury Gel Memory Foam Mattress for my daughter as I couldn't afford another Casper, and to my surprise the new Luxury Gel Memory Foam Mattress address my needs even better than the Casper - my daughter meanwhile is delighted with her Casper, which I would also endorse for anyone looking for a higher priced mattress. I will have to update this later as it just arrived. all boxes in good condition. the base easy to put together. The mattress looks good and is in fact the full 14 inches after about an hour of airing out and open. No smell with this as I had read from other reviews. So far, I am pleasantly surprised and hoping the mattress is comfortable. My son will test it out later this week. I read the reviews prior to purchasing, and yet was still surprised with my order! Not because the mattress is not perfect, it is!!!! There was no odor whatsoever! I'm super sensitive to aromas, scents and odors. Not even a hint! The mattress immediately opens up and shapes perfectly! It has two packagings, so don't be afraid as I was if you take it out of the box, it will still roll up. It's when you take off the second air vacuum sealed packaging is when the mattress inflates. Inside the box, it fit in my Toyota Prius C with seats layed down perfectly! The base. You do not need to purchase a bedframe! The base is heavy! It's wood! It comes with a beautiful cover, but it is not foam! It's a heavy duty base, which I assembled by myself in about 20 minutes. I contemplated returning the base, because I did purchase a bedframe, which I opted to return instead. I can't imagine using the base as a box spring. The decision I had to make was having the bed flat on the floor, using the base included in this deal, or return it, keep the mattress and use the frame I purchased separately so the bed could be off the floor and show more of beautiful area rug and grey/brown wooden flooring. I opted to return the frame that is off the floor, of which I purchased separately on sale, and actually is less expensive than the base deal included with the mattress. The reasons; I've personally have had bad luck with frames in the past. Squeeking, breaking, hitting my shins etc. my room is not big enough for a sleigh bed or a beautiful bed with a base and headboard. THIS base is sturdy and heavy duty!!! My bed looks beautiful sitting on the floor! And the mattress, omgawd! It's sooooooooo comfortable! I purchased a queen firm. It's NOT too firm. I still bought a goose down bed pad, for the days I want a softer, fluffier feel. I imagine the winter months is when I will use it the most. I hope this helped. I couldn't tell from the other reviews the answers provided if a bed frame was needed or not. So again, if you buy the set, you won't need a bed frame!! If you have a bedframe, just purchase the mattress, which can be purchased as a single piece. I'm 100% satisfied with my order! We have had this mattress/foundation since March, and we have been very happy with it. It has kept it's shape, and both my husband and I weigh around 200 lbs. I really feel like I have gotten a better night's sleep with this mattress and don't feel like I toss and turn as much as I used to. Happy customer right here! I absolutely love this mattress! I have always used a spring mattress and have always woken up with soar shoulders and hips. Since I got this mattress I no longer have issues with either its amazing! The only downfall to this mattress is that I struggle to get out of bed in the morning because it's so comfy! you could buy cheaper but not better mattress. when you do you will find all the little things that are missing that you did not know about. this mattress was on the heavy side in the box at over 80 # .it is packed in a compressed state which made easy to get in to bedroom,it expaned to full size in about four hours with no off smells. it comes in a washable cover which is nice. We've had this bed for a month and it is by far the most comfortable bed we've ever had! One of us prefers a more firm mattress, while the other prefers a softer one. Somehow, this bed feels perfect to both of us! It had absolutely no odor immediately upon unpacking, and we slept on it the first night. Neither of us has ever slept so soundly or so comfortably, and it continues to amaze us each night! We both realize that we sleep through the night - no more tossing and turning, and all of our mysterious aches and pains have completely disappeared. This bed is incredible and we both wish we had bought it sooner! Without a doubt it's the best money we've ever spent! At first I was a bit reluctant to order a mattress online as I wanted to test the firmness and quality for myself. I purchased the bed solely on the basis of other customer reviews (thanks guys). Again, I was reluctant in knowing that the bed was shrink wrapped when shipped... TO MY SURPRISE... The bed turned out to be everything the description said it was. The additional foundation was definitely a bonus! This bed is soft, yet firm, comfortable and everything I needed. I am happy. I was very skeptical ordering a mattress online but am glad I did! It is a very nice mattress set. EZ foundation went together perfectly and has a very nice cover. Mattress inflated perfectly almost instantly with no odor like some others reported in their reviews. Mattress is very comfy!! Don't hesitate buying this set! I was very apprehensive about ordering a mattress on line. Similar mattresses cost 4x the price. Mattress is so comfortable. Not to firm or soft, firmness really helps back. Box looks small but mattress inflates in a matter of seconds. Factory odor is bearable and may last 10 days. The best bed I have ever slept in. It was easy to set up, just rolled it out of the plastic and the bed started to expand. The smell was not bad at all hardly notice it now. Really comfortable I have no more back pain really heavy to get it up stairs but worth it. At first I was concerned that the mattress was too firm, but I became accustomed to it in a few nights. Now I’m very pleased! I was Leary about this item but highly recommend it. The box frame is easy to assemble and fit perfectly in my present Queen size frame. The mattress had no odor as described in other reviews and is very comfortable. I am very satisfied and would encourage you to try this product. Mattress arrived nicely packed and t was easy to set it up. It was fun to watch it expand. The bed is comfortable and plush, but my main issue is how hot it is. Granted I am a very hot sleeper, but the foam just makes me roast at night. Otherwise it’s been a great bed. The best sleep I have had in years!!! The box springs were easy to put together and the mattress reached hIts full size shortly after releasing it from the plastic vacuum pack. This set is in a guest room, so I will update my review after family members have had a chance to try it out. The price was excellent and delivery prompt. A great value! The bed came the day they said it would. Both pieces at the same time. You have to put the box spring together, which is really easy. I am a person who likes a platform bed and this bed is high enough to where it is not uncomfortable. It is very comfortable, I like a medium firm mattress and this is perfect. Would recommend this bed. "Does this mattress come with a bed frame?" No, this is the mattress and foundation only. "What does this set weigh?" "What does foundation mean is it a box spring?" This foundation is a rigid wood support foundation for the mattress, with a top layer of wooden slats. A box spring is sometimes used as a generic term for any foundation underneath the mattress. "I don’t have a platform bed and ordered the bed without the base I didn’t see this “set” do I need a box spring in this case? " This listing includes both a mattress and foundation. If you have a platform style bed frame you will not need a foundation. "I have a hard plastic 2 piece foundation, will it work with this mattress?" "I have a foundation for a regular king bed. It's a split hard plastic foundation. Will it work with this mattress? " "what is the king version of this mattress"